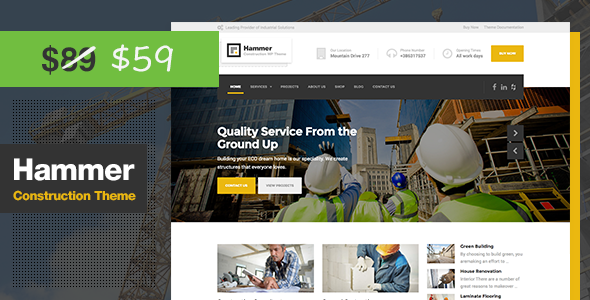 Introducing Hammer, a premium construction industry WordPress theme. With its light and clean design it is a smart choice for companies both large and small. Hammer has everything you need to take your business to the next level, but most of all, it is extremely easy to set up and use. Your new website will be ready in no time. Changelog Check the changelog for Hammer. Compatible with WPML, WooCommerce 3.0.x, WooCommerce 2.6.x, WooCommerce 2.5, Bootstrap 3.x. Hammer has been tested with browsers IE10, IE11, Firefox, Safari, Opera, Chrome, Edge.